Whatever you call it, hard luck or inadequate preparation, the King of Kings Calypso extravaganza was a mixed bag as a show advertised for 9 pm started in earnest after 11 pm. As a paying patron, I did not know what to make of it except to say the tolerant audience, other than a couple gentle claps, just waited and waited. I will not resort to speculation although one has the right to do so in the absence of official information. Common decency required a formal announcement as to why the ridiculously late start. The sound quality was woefully inadequate in the first 40 minutes but improved with time as a cluster of Kings graced the stage putting on splendid performances. Former Road March King Sye gave a good account as usual and so did Sour- Sour after being absent from the stage for a couple years now. The Observer presented to maximum effect some of his greatest Road March songs such as "Spirit of the Carnival" while Karessah was his brilliant self with his best composition "Hook in a Minor" supported by some of his more spicier renditions such as "Ian Douglas". King Bobb started rather lukewarm until he later improved with the two songs that won him the crown after 17 years. He reminded the crowd "Go and Sing the Truth, Bobb" and "Who Feels it knows it". By then the massive crowd 'felt it' and Harlem Plaza were singing in unison. On the other hand King Hunter- the Dominica Calypso Association president got it right from the get go; up to the end of his stint with the mega patriotic hit song "One Flag". It was refreshing to once again see Dominica's most international Kaiso artiste grace the stage after a two year hiatus. The last-moment inclusion experiment with Super L did not work mainly because he sang on play -back and failed to draw the required response from the audience who were immersed in the live Swinging Stars groove. The veteran Road March winners Robin and Spencer from the Seventies were brilliant with nostalgic tracks as "Suzie", "Take me Back" and "Mona" respectively. The latter even ventured singing Lord Bingo's "Pointe Michel Girls" and did so with excellence. Harlem Plaza was by then on fire. However, it was Dominica's second three peat king, Solo, and the eight-time Monarch Dice who were the stars of the night. In fact "Mass in de Cemetery" and "Looters" were the biggest songs for the night with the greatest appeal and crowd participation. If anyone had any doubts it was proven as I have said before that "Mass in de Cemetery" is Dominica's greatest Calypso composition ever. For a song to be even older than the country itself and still play on the road and captivate all audiences, is not just nostalgic but brilliant. Solo also complimented with "Janey Scandal" and "Licks for 76" his performance well with a unique vocals which seem to be still intact. I listened carefully from my perched position at the VIP booth, at the melodic structure of the kings of the past and the present performers and I concluded that while today's Calypsos have better lyrics in terms of structure, the melodies of yesterday's composition were superior, hence it's haunting and has that simplistic sing-a-long factor which contributes to its longevity. Queen Tasha P was at her brilliant best and stormed the place with "Is a boy" "Wrong Plus Wrong" and "Woman Time". She was certainly among the top acts for the night. I am sure all the ladies would agree. Lugars who did not sing his second most popular Calypso "Ca eat Concrete" probably made a politically correct decision, but it was indeed inexplicable that he failed to sing the biggest song of his career ''Internet children" when all the other calypsonians presented their best. Quite opposite to Lugars, King Dice had no pretentions and represented his sentiments to the large number of people from the diaspora and locals alike- "Animal Farm"; "Looters"; "Dominica Trade House.com"; "On my own" were all belted out as the audience seem to sing in a frenzy word for word. The enigma is that it is not just the so called "Blues" who jump, sometimes more "Reds" jump in approval of the lyrics, yet this does not seem to translate to votes as used to happen in the Seventies and Eighties when Spider sang "Hypocrites" and NC "Mamo doe Rock de Boat" or Hurricane's "Tiway yo". No longer does Calypso have the ability to "make and break governments" as Scrunter once alluded. This could be an interesting study for psychologists as lay people like me, would surmise that Calypso does not have the socio- political impact it once had and is just seen as entertainment. The message does not go too far beyond the stage. If so, this is unfortunate as the art form is supposed to be the pulse of the nation and mirror society's values. 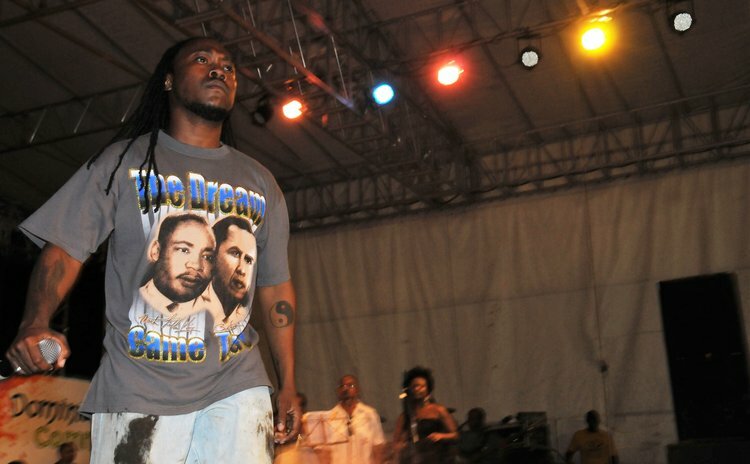 In the show, Dice was indeed an anti-climax as Sye once again graced the stage to sing a medley of old-time Calypso hits. This signaled to take my leave after 3 am, the time when Daddy Chess was introduced. I long suspected that Super Blue etc., would not appear. Again, no prior apology. In the end I would surmise that this show as with most Anna Marie Clarke's productions, did not suffer for want of promotions and the turn out would out-weight the "Testing the Best" Calypso shows, as the biggest local Calypso show outside the carnival season for as long as I can remember. The performances were all good. Hence, the promoter must be complimented for staging this activity for so many years in New York, and now, in Dominica. The weaknesses for this franchise seem to be in actual execution and delivery in a timely manner, what was promised. This is a growing cause for concern.